Natural emerald gemstone astrology rings or pendants are used to harness the power of Planet Mercury also known as Budh. Natural treatment-free emerald is also known as Panna stone in Hindi. Mercury is the planet that rules over intellect, creativity, accountancy, trade, information dissemination and merchant activity. 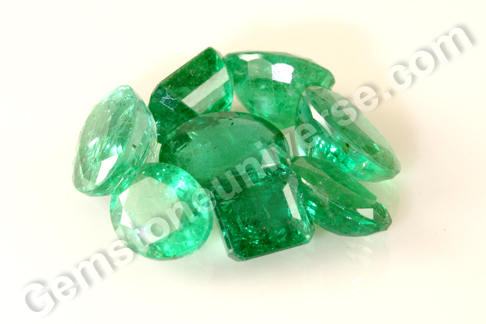 Individuals born with Gemini ascendant or Virgo ascendant can wear emerald for benefit from planetary gem therapy. 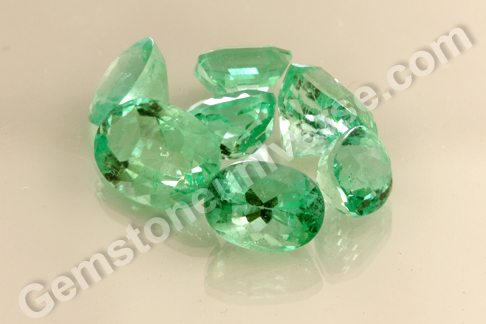 Natural emerald green stone is the May birthstone. In the West, individuals born in the month of May like to wear an emerald for good luck but this method of birth month determining suitable birthstone is quite arbitrary. Emerald Birthstone Benefits in Vedic Astrology provides a far more accurate gemstone suitability recommendation. Wearing emerald gemstone is believed to beget an individual prosperity along with recognition and good name. It is believed to aid emotional healing and therefore progress at a soul level. It is also said to spark creativity. 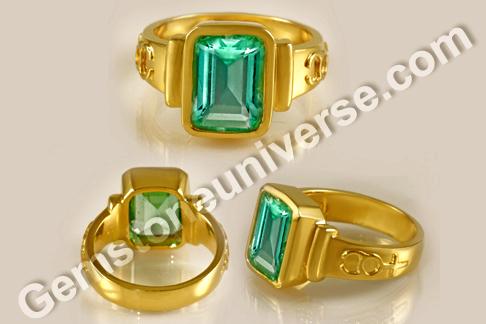 Comments Feast your eyes on this beautiful talisman natural emerald gold ring. A splendid fully natural Colombian emerald of 3.36 carats set in 22 karat gold. The classic emerald cut gem has a rich emerald green color and exceptional clarity for a natural treatment free emerald (rarely are they without a plethora of inclusions and other crystal growths). Just this clarity factor in this natural gemstone is enough to catapult this gem into the league of premium gems! 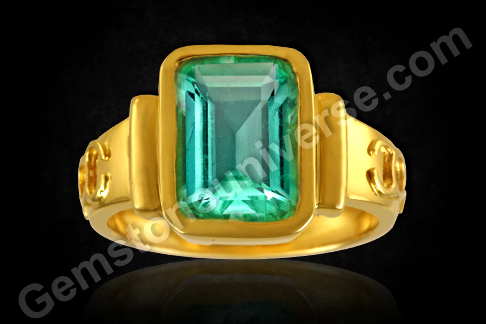 The emerald gold ring also has the symbol of Mercury standing in relief in the shank of the ring.View this Gemstone before it was set in a ring. Note: The above links generally exist on the website for a period of 40 days after which they are periodically deleted to make way for new gemstones and to enable faster browsing. 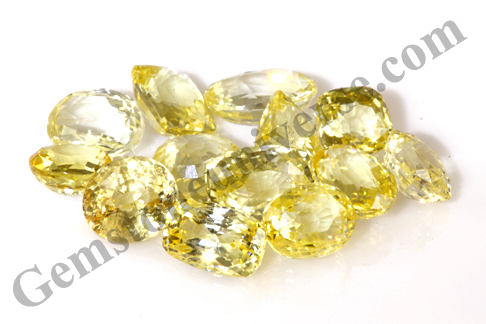 Yellow Sapphire Gemstones unheated, Gemstoneuniverse is proud to present two new lots of pristine unheated Yellow Sapphires Gemstones for its patrons. One look and you will be enthralled at the power of Mother Nature. Both these lots have super premium color ranging from top Golden Canary yellow to the preferred medium butter yellow. In the realm of Gem Therapy, it is important to use Yellow Sapphire gemstones that are free from any flaws, as mentioned in the sacred texts, to get the full benefit of pursuing the therapy. 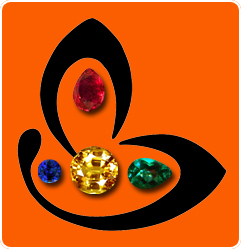 We at Gemstoneuniverse are blessed to identify and source some of the best quality Jyotish gemstones for individuals interested in gem therapy from mines across the world. Aptly christened as Prabhu – The Supreme Lord and Sriman -The lord of Lakshmi these yellow sapphire stones have these essential attributes. Just have a close look at the video and you shall find why the Jyotish Gemstones are so special, so pristine, and capable of delivering those magical results as described in the sacred texts. The planet of good luck, fortune , education and wealth – Jupiter is the planetary deity whose power is inherent in the Yellow Sapphires stone. 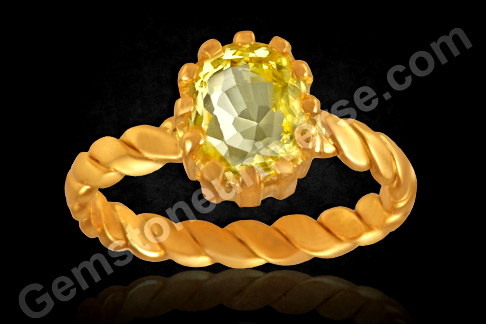 Yellow Sapphire Stone also known as pukhraj can be worn by Sagittarius and Pisces ascendants. For other ascendants one should have a thorough Vedic Astrology analysis. These Sattvik Yellow Sapphire Gemstones will deliver the best of Guru energies Lord Brihaspati has to offer. – Is completely Natural, Unheated and Untreated. – Super premium near perfect color in Gemology Terms. – Scintillating cut that maximizes lustre and maximum play of light. The Lustre is electric. 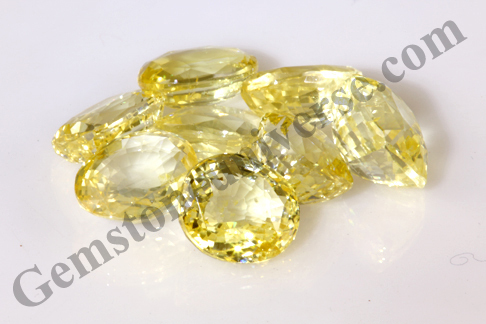 – Remarkable clarity of 95% and above which is remarkable for an unheated yellow sapphire Gemstone. – Free from any flaws as listed in the sacred texts to be a top Jyotish Quality yellow sapphire Gemstone Online. – Available at a price that’s jaw dropping. Unmatched at any source – mine, market, wholesale or retail, given the 5 quality features above. The name moonstone is derived from the sheen of the Moon. Moonstone is a Feldspar Mineral with the chemical formula of (Na,K)AlSi3O8. Basically a Sodium Potassium Aluminium Silicate it is available in a variety of colours Peach, White, Milk, Gray, Rainbow and Blue etc. Blue Moonstone in Indian Astrology is the superior Alternative Gemstone, also known as Uparatna for Moon. The basic Gem for the moon is Natural Pearl and the best alternative to Natural Pearl is Blue Sheen Moonstone. It blesses its wearer with peace, calmness, serenity, good health and vitality. These natural and treatment free blue moonstones come from the island of Serendib, currently known as the island of Srilanka. The cabochon cut gems have fantastic clarity and superb schiller – The adularescence is what makes this blue moonstone so distinct from the myriad other moonstones that are generally more translucent – cloudy in appearance. There is also a watery appeal that identifies strongly with moon energies. Blue moonstone is the upratna for natural pearl and is the gemstone of planet Moon. Blue moonstone is known as chandrakant mani in Hindi. Even though Blue Moonstone is found in quite a few places in the world, the gems that make the cut as Gem quality and especially Jyotish Quality Moonstones are very rare. The supply of Superior quality Blue Sheen Moonstones from India and Srilanka have markedly declined with most of the Sri Lankan Moonstones now coming are from vintage lots that individuals have preserved over the years. 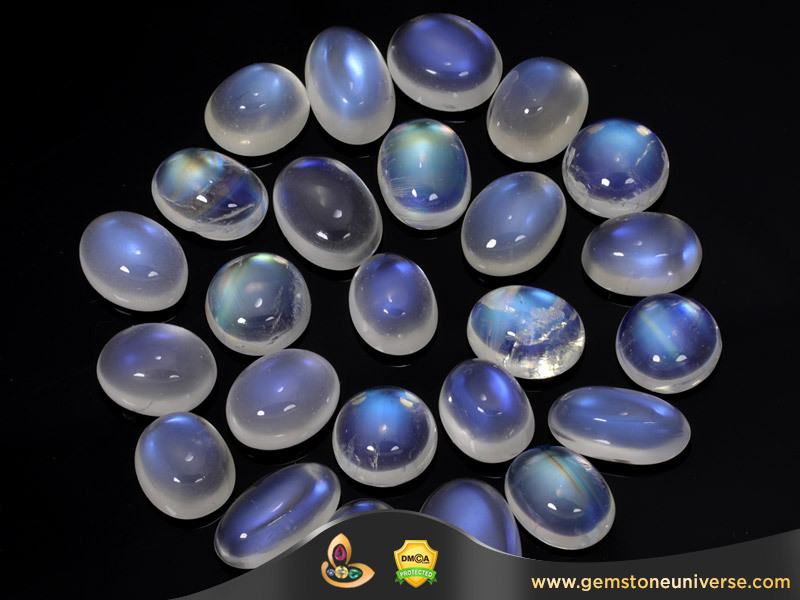 The Blue Moonstone Price depends on the 4 C’s , lack of treatment and the nature of the adularescence. The new lot of Blue moonstones comes after a long spell. Some of you may have even noted non-availability of a jyotish quality blue moonstone at www.gemstoneuniverse.com for a while. Please note that not every gem makes the cut as a jyotish gemstone and we at Gemstoneuniverse believe in giving you nothing but the most genuine and best jyotish gems. Every gem is handpicked and unless it meets the stringent criteria, it is invariably rejected. This despite the fact that we carry thousands of Blue Sheen Moonstones in the Gemstoneuniverse Buying Division we rejected around 200 odd lots to get the Perfect Jyotish Quality Moonstones that will work exceptionally for Moon Energies. Some of the lots that we rejected were priced 3-4 times the price of individual fine gems made available to you dear patrons. This Situation has continued for now over a year. We would also like to use this post to inform our dear patrons that Natural Untreated Treatment Free Yellow Topaz the Uparatna for Jupiter is also undergoing similar equations. We are trying our best but we cannot guarantee a set date when these will be available. What we can guarantee is that you will get a Top Quality Jyotish Gemstone at 1/6th of the price. If a Gemstone does not qualify to be a Jyotish Gemstone it shall not be listed at Gemstoneuniverse.com online inventory. This lot of Blue Moonstones have been christened after the name of Lord Vishnu. 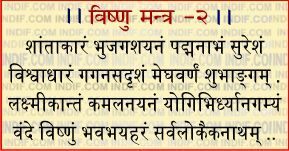 Manuh means one who has manifested himself as Vedic Mantras. These Blue Moonstones have precisely pure, divine Vishnu like energies and are teeming with energies of the moon. – Comes at a very attractive price point. 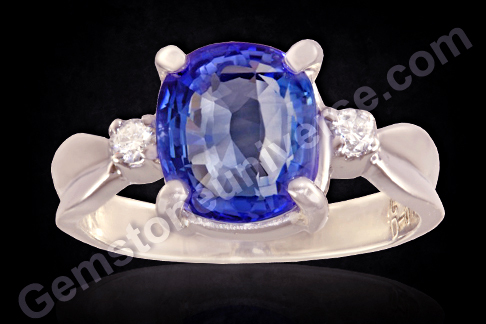 At Gemstoneuniverse.com the entire range reflects unmatched quality and pure blooming blue color. Our unparalleled range of blue moonstone gems is desirable for its beauty, and durable enough to be enjoyed for generations. Valuable for arousing a feeling of scintillating fire, these blue moonstones have a unique attribute to glow intensely even when there is very little light. Wish all The Gemstoneuniverse Patrons the very best of Moon Energies from the new Lot Manuh 2013. After a Long wait Gemstoneuniverse is proud to present loose Cat’s Eye Gemstones for harnessing the energies of the divine planet-Ketu. We list only those gemstones at Gemstoneuniverse that qualifies as a Jyotish Gemstone and not anything else. 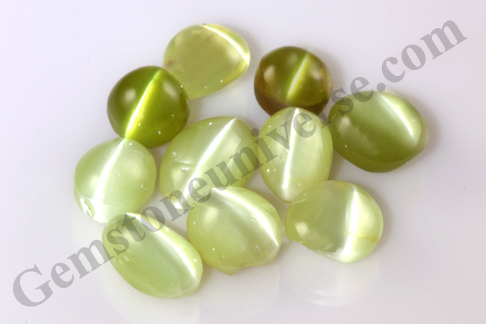 In the past 6 months, there is a severe shortage of natural treatment free Cat’s Eye Chrysoberyl in the markets and whatever Cat’s Eye is coming is not Jyotish Quality. After a lot of searching we are presenting this lot of Cats Eye to you aptly called as Akshara. 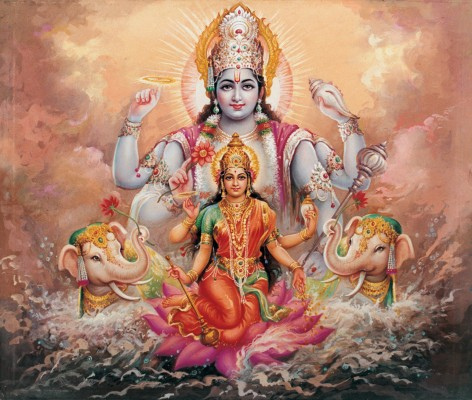 Akshara is the name of Lord Mahavishnu and it means indestructible. The qualities of Victory and Being Indestructible are evident in these Jyotish Cat’s eye that shall give powerful and potent results for planet Ketu. The origin of these Cats Eye Gemstones is India. The Chatoyant band formed is strong and noble. Cats Eye Gemstone is the Gem that represents the powers of Planet Ketu as per Vedic Astrology. Suitability of Cats as per ascendants and vedic astrology analysis is essential before one wears a Cats eye. The mind is a powerful mechanism. It is the ultimate deciding force where success or failure; verve or hopelessness are concerned. If the mind is strong, any situation can be overcome, any mountain scaled! However, if the power of the mind is compromised, it can become a self-defeating mechanism, a tool of destruction. 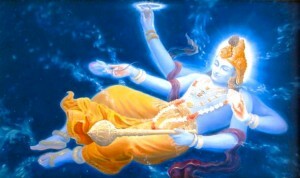 In the world of Vedic astrology, mind is the domain of the planet Moon. Its influence on the mind is similar to its element – the water! Just as the watery element shifts, ebbs and peaks, the mind also oscillates as the Moon would have it. If the Moon is strong, there is a greater stability and balance, which is vital for good decision-making and subsequently good action. In a birth chart, the planet Moon finds its exaltation (peaks in its power) in the sign of Taurus and finds debilitation (is extremely weak) in the sign of Scorpio. A debilitated Moon should always be strengthened by wearing its gem – the natural pearl. Such a position of Moon can lead to a dysfunctional way of thinking and distort view of the world. While Moon is the biggest governing force for mind, one must also understand the role of the planet Mars in on the mind. Mars denotes a raw power – the essential life force that gives courage, determination, stamina and vitality. One has to appreciate that the state of physiology and the state of mind are interlinked deeply and they can each affect the other. A hampered or hyper state of physiological function alters the thought. It either may lead to depression or may lead to an agitated state – the point to note is that balance is missing. A compromised Mars can bring about just this kind of results. Deep-seated complexes trigger strong self-preservation mechanisms that can be seen as maladjustment by society. 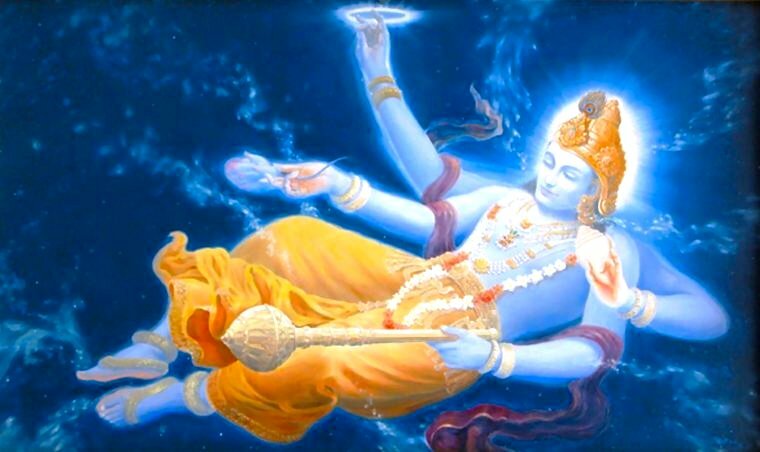 In case of a debilitated Mars (Mars becomes weak in the sign of Cancer which is ruled by Moon, and hence the mind connection can be established), it becomes imperative to wear a white coral life long which helping in balancing the physiology and the state of mind too. Interestingly, both the natural pearl as well as white coral are gems of organic origin and are found in the seas. For the purpose of planetary gem therapy, these gems, white coral and natural pearl must be set in silver as talismans. To read more about challenging planetary positions such as the ones talked about above, click here. Featured today is a two-gem pendant that incorporates an organic Australian natural pearl of 3.83 carats and an organic, natural Italian white coral of 3.99 carats set in Sterling silver as a fantastic talisman. Natural pearl / moti is the gem of planet Moon. 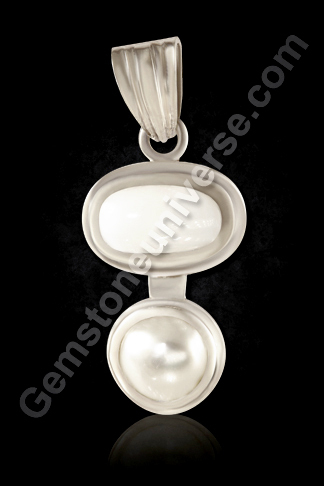 The pearl used in this particular talisman is pristine white in color and has a beautiful luminescence about it. Natural white coral / safed moonga is the gemstone prescribed for a debilitated Mars/ mangal. The rich green color of emeralds is matchless in its ability to soothe and rejuvenate. Green is the color of freshness and new life. Among the gemstones, emerald holds its own just because of this exceptional trait. No matter what the shade of emerald, it stands out and one will be able to notice during the process of selection that there is invariably a shade of emerald that complements the skin tone of the individual. Gemstoneuniverse presents its two new parcels of fully natural treatment free Colombian and Zambian emeralds – Manimal 2013 and Matang 2013. Colombian emeralds are marked by a lighter shade of green but much clearer crystal. The Zambian emeralds on the other hand are characterised by a deep rich shade of green with a hint of blue. On an average the Colombian emeralds are highly valued compared to their Zambian counterparts. But real determination of value is done on the basis of individual gem and its measuring up on the benchmarks of cut, clarity, color, carat weight etc. A prized Zambian may sometimes outdo the Colombian gem by a great margin. According to Vedic Astrology, Natural emerald or zammrud or panna is the gemstone of Planet Mercury or Budh. While picking gems for use in planetary gem therapy, Gemstoneuniverse makes sure that these gems are top of the line, with even the emeralds (that tend to be highly included, as the crystal grows naturally) displaying enviable clarity and great lustre! There are no compromises made on quality and even great looking natural gems are rejected, if they carry internal flaws (doshas) that could interfere with your gem therapy. The gem of love, Ruby is the red member of the Corundum family and is often given as a gift to show the strength of one’s relationship. Its rich, vivid red colors are due to the presence of chromium and its almost identical twin sister, the Sapphire, is similar in all but colour. Until the early 1800’s many other gemstones, including Spinel and Garnets, were often misidentified as Ruby. Most Rubies show purplish red to orangey red hues; however, the overall colour (colour being a combination of hue, shade and saturation) can provide gem dealers with an indication of the stone’s original geographic origin. Burmese Rubies tending to be purplish red in colour, while Thai stones tend to be brownish red. Ruby shows pleochroism, which means that the colour varies when viewing the gemstone in different directions and many can appear incredibly bright when exposed to the sun (see fluorescence). 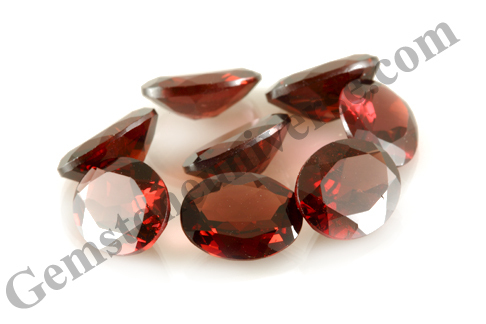 Inclusions in Rubies are called “silk”, and if sufficiently abundant and precisely arranged this can lead to wonderful asterism; with the correct cutting, Star Rubies can often be created. 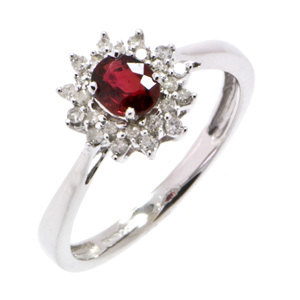 Ruby has been a popular gemstone for centuries and has been set in many famous historic pieces of jewellery. Ruby mining can be traced back over 2500 years ago in Sri Lanka. The famous mines in Mogok, Burma were first explored as early as the 6th century AD. Historically, the gem has had many different names around the globe, which highlights how popular it has been with many different civilizations. In Sanskrit, the Ruby was known as “ratnaraj” which stood for “the king of precious gems”, and later “ratnanayaka”; “leader of all precious stones”. The gem was referred to in the Bible as a Carbuncle, although today research has shown that this name was also used for several other red gemstones. Its more recent name, Ruby, is derived from the Latin word “rubers” simply meaning “red”. As can be imagined, the gem is surrounded by a great deal of folklore and legends. In the ancient world people believed that Rubies could help them predict the future and they have been worn as talismans to protect from illness or misfortune ever since. It has also been said that the wearer of a Ruby would enjoy romance, friendship, energy, courage and peace. Pliny the Elder, influenced by the writings of the ancient Greek philosopher Theophrastus (371 – 287BC), wrote “In each variety of Ruby there are so called “male” and “female” stones, of which the former are the more brilliant, while the latter have a weaker lustre”. Considering Pliny’s work took place almost 2000 years ago, this remains one of the few theories relating to gemstones that he misinterpreted! In Burma and Thailand one legend tells of the ancient Burmese dragon who laid three magical eggs. From the first egg came forth Pyusawti, king of Burma, from the second emerged the Chinese Emperor and the third egg provided all of the vivid Rubies in Burma, many of which local gem traders will tell you are yet to be discovered. Shortly after Marco Polo documented his travels (in which he recited how Ruby was used by people of the Kahn to protect themselves in battle), Sir John Mandeville wrote a book of his own global experiences (compiled circa 1365). Mandeville believed that “once a man had touched the four corners of his land with his Ruby, then his house, vineyard and orchard would be protected from lightning, tempests and poor harvest”. For many centuries, Ruby has been thought to remove sadness, prevent nightmares and protect against many illnesses. With its likeness in colour to blood, it has often been said to help stem haemorrhages and cure inflammatory diseases. It is said that over 95% of Rubies on the market today have been heat-treated, therefore whenever buying a Ruby it is best to assume that the gem’s colour has been enhanced. Large, natural Rubies of good colour and clarity are so valuable that they often demand a higher price per carat than even the most flawless Diamonds. 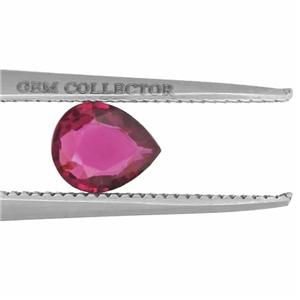 For example, in 1988 Sotheby’s auctioned a 15.97ct Ruby which sold for more than 3.6 million dollars under the hammer! Some of the finest Rubies are from Burma, where their colour is said to be comparable to that of “pigeon blood”. Other sources include Thailand, Vietnam, Sri Lanka, Kenya, Madagascar, Tanzania, Cambodia, Afghanistan, and India. Ruby is the birthstone for July and is also the anniversary gemstone for both the 15th and 40th year of marriage. As it has a hardness of 9 on the Mohs scale, it is a tough and durable gemstone, and when set in precious metal should continue to shine for thousands of years to come. 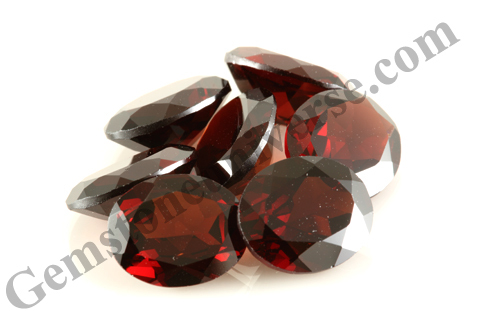 Besides being used in jewellery, Rubies are also used extensively in laser technology. The Genuine Gemstone Company is winner of the Sunday Times Fast Track 100.